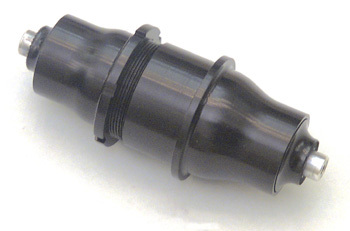 Nimble's newest (generation 3) CROSSWIND front 19 hub is revised as of Sept 2005. It now weighs a scant 78 grams. (It is so new the picture above is still the older style generation 2 - the new endcap now looks different). The shell is made from 6061-T6 alloy for low weight, high strength and durability. This revision expands the central axle diameter out to 19.5 mm, comparable to downhill mountain bike hubs. The design features integrated alloy endcap/dust covers and high quality Japanese precision sealed cartridge bearings. It offers low rolling resistance, low maintenance and reliability. An axle-dominant assembly process improves bearing alignment and smoothness. The bearing size is 6803. See CROSSWIND rear and track hubs and pricing.